Cal Hehnke (above) pitched the last three outs for the save in the game against Nebraska. Half of this year’s Maverick baseball team were not a part of the roster in 2017, and if that doesn’t spell it out for you, Omaha baseball is in the midst of a culture change. The Mavericks are enjoying success that was absent a year ago and they’ve been led by some young faces and newly-acquired talent. “The attitude of this year’s team are guys that want to work, want to be coached, and want to win which makes things a lot easier,” said Coach Evan Porter. Players like junior dh and pitcher Grant Suponchick, senior catcher Adam Caniglia and sophomore third basemen Cole Thibodeau are some of the Maverick leaders that returned from a tough 2017 season and are now helping the program build off the positives established last year. “We wanted to bring in guys that are gamers, have high character and so far, these guys have bought into trusting the process,” Porter said. Some of these additions such as junior left fielder Thomas DeBonville, sophomore short stop Keil Krumwiede and junior first basemen Braden Rogers have all bought in. Young local Omaha products freshman RHP/INF Tommy Steier and redshirt freshman Joey Machado have also added some much-needed strength on the mound this season as has freshman Spencer Koelewyn. The Omaha baseball team beat Nebraska for the first time in 21 years last week in an 8-7 nail-biter at Haymarket Park in Lincoln. 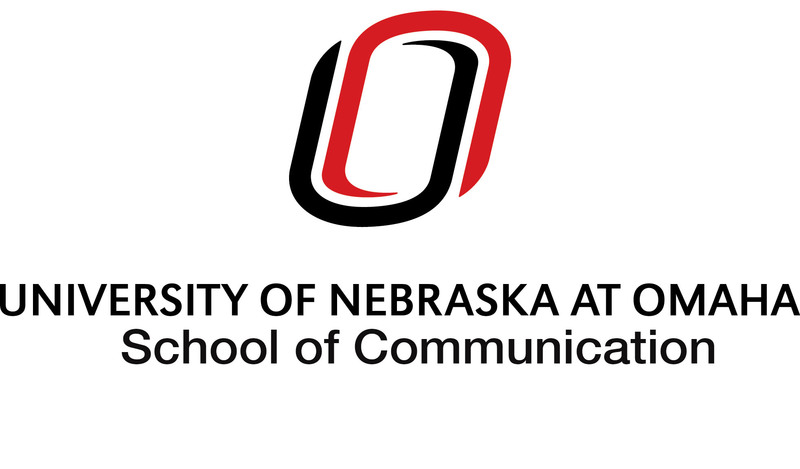 Omaha was assisted by a Nebraska pitching staff that hit five Mavericks and walked nine more in front of a Cornhusker defense responsible for a pair of errors. But most importantly, the Mavericks were able to hold on and finish off an opponent who has been an issue this season. The game was rough for both teams, but the Cornhusker pitching staff had one of their sloppiest outings this season. “We just played a little better that night and that’s just baseball, sometimes it’s all you need,” Porter said. Omaha used speed and three singles, followed by a sac fly, to manufacture a pair of runs in their first at-bats. Nebraska answered in the bottom half of the first with a two-run homerun to tie things up. Two more runs came in the third inning for Omaha on a pair of bases-loaded walks. Once again, the Mavericks had the bases loaded in the sixth-inning before Max Gamm knocked in two RBIs with a single while another run scored on a wild pitch and another walked-in. Omaha led 8-2 after six, but Nebraska didn’t quit, scoring five runs over the next two innings, which forced Omaha to hold on to a one-run lead in the ninth – which they did. Some interesting notes from the Nebraska game, Malik Moore (1-2) earned the win in his first career start, while Steier made his first career start at shortstop with a pair of RBIs on the day. 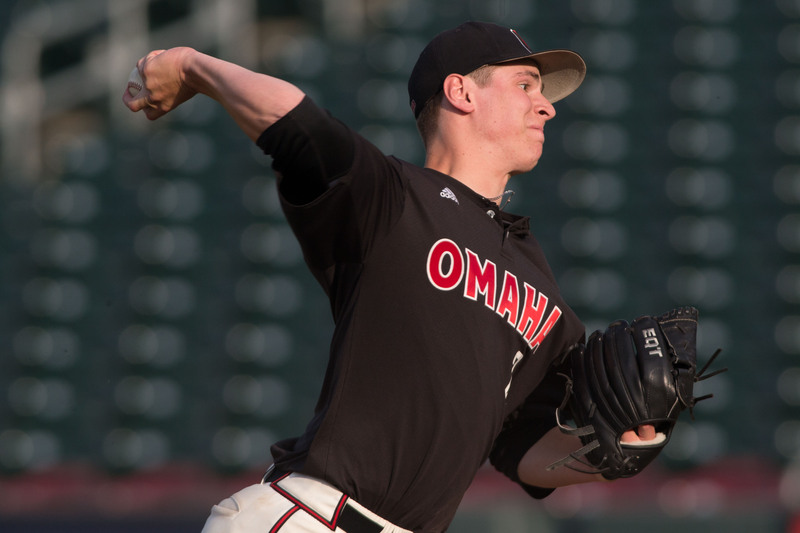 One more career-first for the Mavs was Krumwiede’s first career pitching appearance in an Omaha uniform. The sophomore from Montana struck out four in two innings of hitless ball. Cal Hehnke earned his fourth save this season by shutting the Huskers down in order in the ninth. The Mavericks spent last Thursday on the road traveling to Fort Wayne for a weekend series that began with a doubleheader on Friday. The Mavs dropped both games, surrendering 22 runs on the day, while only plating a pair. Game one saw the score 3-2 in favor of Fort Wayne before the Mastodons scored six runs in the bottom of the eighth. Omaha had a pair of uncharacteristic performances on the mound from their starting pitcher in each game. Redshirt-freshman Machado (4-4) surrendered five runs on 14 hits over seven innings of work in game one, while freshman Koelewyn (2-4) allowed four runs, three earned along with four hits in an inning and a third. Thibodeau had four hits on the day including a double in game one and a stolen base to go with his two singles in game two. 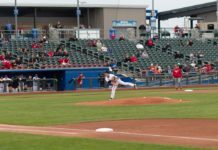 Saturday’s matchup picked up where Friday left off for the Mastodons, as Omaha was restrained to just one hit in a 5-0 loss. Three Maverick errors in the third inning helped Fort Wayne tack on the five runs they needed. Rogers broke up the Fort Wayne no-hit bid in the seventh inning. Hehnke’s six innings of relief allowing no runs on two hits and at one point, retiring 11-straight Mastodons was the lone bright spot on the afternoon. Omaha has three conference series remaining this year at North Dakota State and Oral Roberts before returning to Seymour Smith Park for the season’s final series against Western Illinois.